This week’s redesign is about ParadisePoker’s lobby. ParadisePoker is Sportingbet‘s poker brand and their client is built by Boss Media (my former employer). I play on it every now and then and I really enjoy the clean and nice tables, it helps me to focus on my game. But I find the poker lobby to be too cluttered with functions and information. The main problem I have with it that it doesn’t really help me to start playing because everything seems to have the same importance. Balsamiq is a rapid wireframing tool that is really cool. If you haven’t seen it before then you should check it out. Image 1. 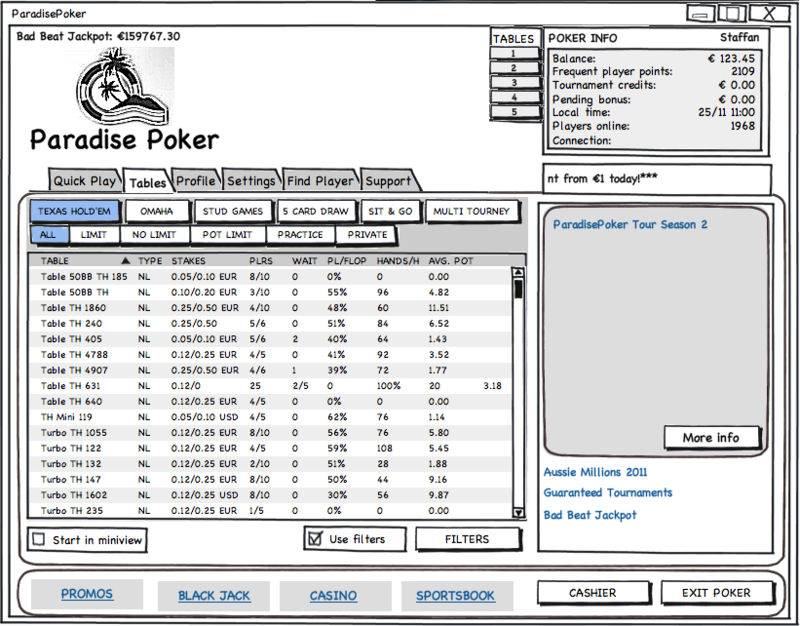 Balsamiq version of current ParadisePoker lobby. The goal of the redesign has been to make the lobby simpler and to put focus on the important thing, start playing poker. 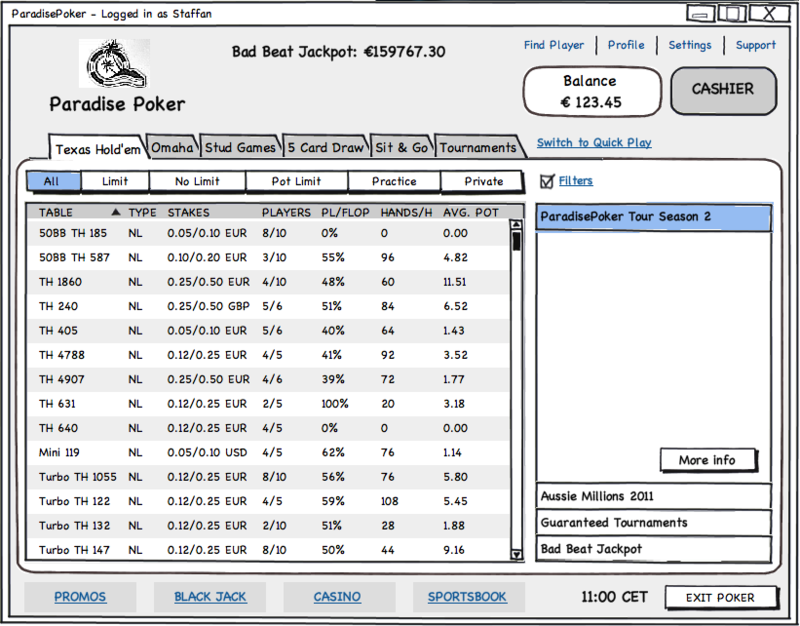 Made the ParadisePoker logo a little smaller to get more available space. Moved and increased the size of “Bad Beat Jackpot” and it should also be a link to more information. In the current version there are top tabs, “Quick Play”, “Tables”, “Profile”, “Settings”, “Find Player and “Support”, which all have the same dignity in the design. I’ve put links at the top right for “Find Player”, “Profile”, “Settings” and “Support”. I’ve also put a link to “Switch to Quick Play” since it and “Tables” are two different layouts of the lobby. Only show the balance and not the Frequent Player Points, Tournament Credits and Pending bonus. This information can be shown when it is relevant. Made the “Cashier” button bigger and put it next to the balance. Moved the filter function to the top next to the other filters, and removed the button “Filters” and made the text “Filters” into a link instead. Increased the font size in the tables list and made the list taller.